I love playing with legos – you can never get old for lego building projects. So the project was simple – we needed two more shelves in a cupboard – I was thinking about wood, cutting etc. however we then found a piece of gypsum board lying around – the below guide was easy to cut and install. Measure the length and width of the area where the sheetrock will go. Measure carefully and draw reference marks on the new sheet of sheetrock. Use a straight edge (one that is at least as long as the cut) and place it on the sheetrock, lined up with your reference marks. Using a sheetrock knife (or a utility knife), make the first cut. Try to cut through the paper layer, but don’t go too deep into the sheetrock. Make sure to cut the full length. It is unnecessary to cut deeper than just the paper- it will only dull the blade.You need only to cut through the paper and it will break very easily at the cut. Turn the sheet over and bend the smaller part of the sheetrock up, to about a 90 degree angle. This will break the remaining sheetrock. With the smaller piece bent, you should be able to cut through the paper on the back side, along the bend where you made the first cut. 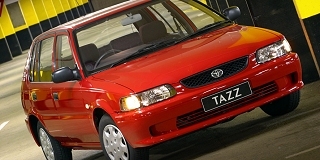 Still one of the most reliable cars around – my trusty Tazz.